Shirts With Random Triangles: Les Miles Reading A Book? 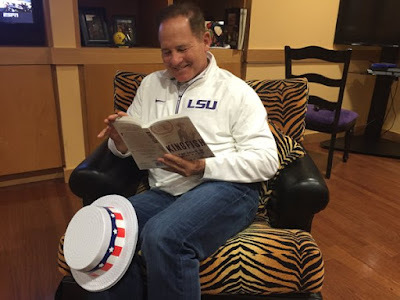 Les Miles Reading A Book. Miles tweeted out a pic of himself reading Kingfish: The Reign of Huey P. Long, Richard White's 2006 biography of the controversial Louisiana political boss. Long served Louisiana both as its governor and later as a US senator before his assassination in 1935. Among his accomplishments as governor was the transformation of LSU from a small Southern college into one of the top universities in America. Kingfish is the focus of the East Baton Rouge Parish Library's "One Book, One Community" program. The program seeks to encourage literacy in the community by bringing it together through reading the same book together.